The ideal winch for many agricultural and commercial applications such as moving heavy equipments and lowering boats. • Gears are arc-welded and drive shaft gears are copper-brazed for durability. • Rigid, welded reel construction for added strength. • Ratchet-type pulling winches free wheel when the ratchet is disengaged. • Standard finish, powder-coated metallic copper bronze. • Heavy-duty steel handles have molded grips. • All drive shafts have permanently lubricated bearings. • Two-way ratchet allows line to come from underneath or over the top of the reel. Product Tip: Choose the Dutton-Lainson® winch that is right! for your job. Dutton-Lainson® pulling winches are not recommended for lifting applications. 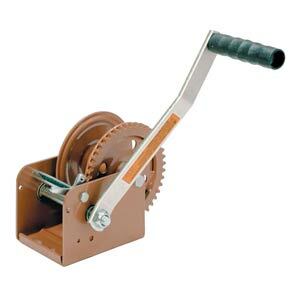 For lifting, use a Dutton-Lainson® brake or worm gear winch. Dutton-Lainson® winches are not intended to be used as hoists for lifting, supporting or transporting people or for loads over areas where people could be present.